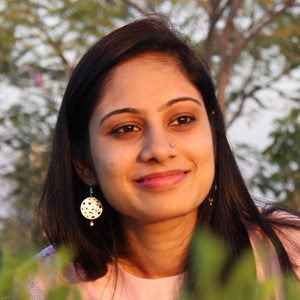 When you are talking about street food in India, Sandwich and Samosa is most popular street food along with Chat. Honestly speaking, I can never make competition with street food. They can be never replaced with homemade trials. Yeah, but I always do some innovative touch to that ordinary street food. For example, Lentil samosa is my version of ordinary samosa recipe. And That Homemade Basket chaat stuffed with sprouts is homemade healthy version of street basket chat recipe. 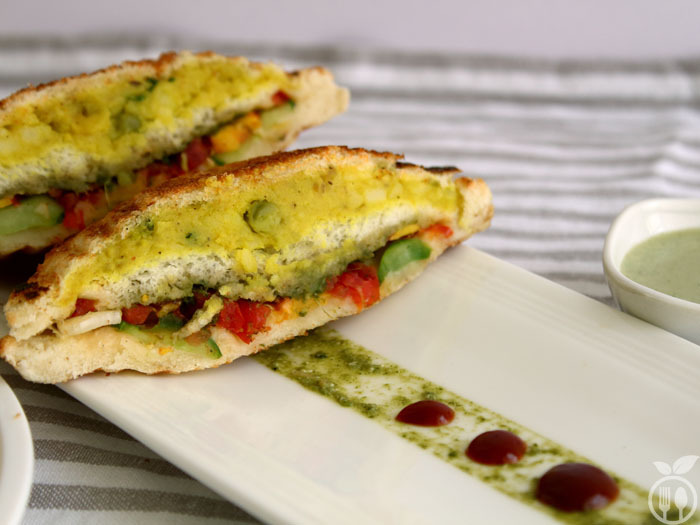 When I want light dinner, I always prefer the vegetable or potato sandwich recipes, and most of time grilled one because grilled sandwich makes it complete meal. 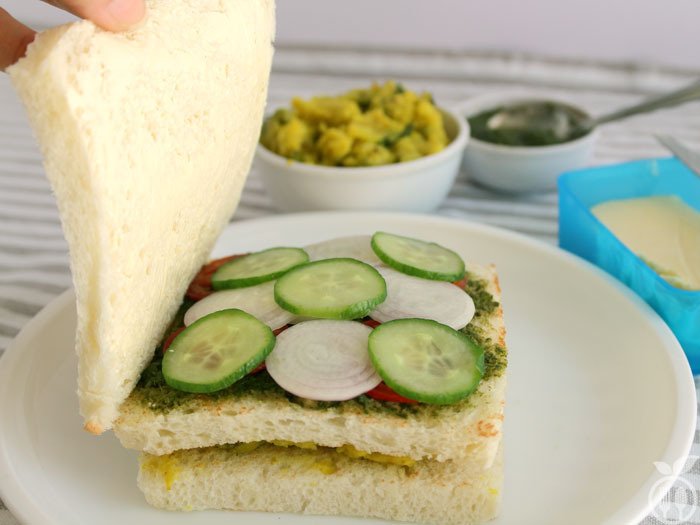 While only vegetable sandwich is best option for daily breakfast. This combo of two type of sandwich is actually the idea of my hubby. He is foodie person, and always inspire me to create new dishes from ordinary one. 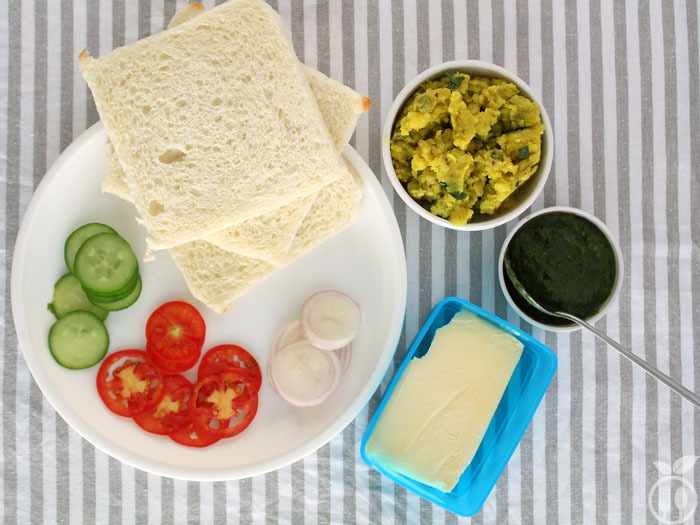 He some time have vegetable sandwich in breakfast but he likes grilled one, so he told me to combine Aloo Masala Grilled Sandwich and Vegetable Sandwich. To make stuffing of mashed potatoes, you can use leftover mashed potatoes also. All you need is tadka (tempering). The punch of ginger and green chili make it perfect for delicious stuffing. and use it one layer of sandwich. 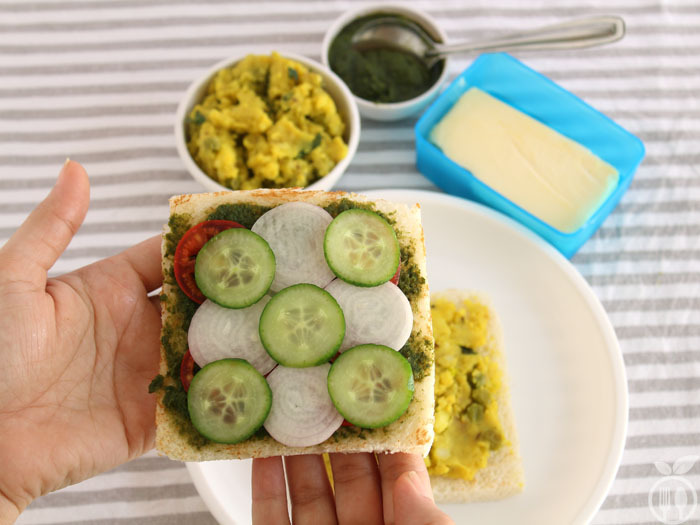 For making another layer, spread the chutney, put the slices of vegetables. I have used the tomatoes. Then used the onions and cucumber, you can also use carrot, beetroot and bell peppers. Now, carefully transfer the vegetable stuffed layer on top of the mashed potato layer. Finally on 3rd slice, spread the butter and cover veggies with that slice. Then, grill it on griller or toaster. 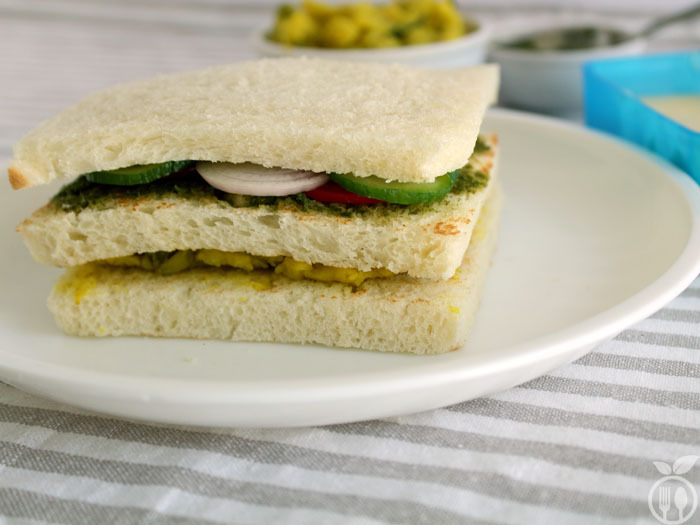 and you will get crispy and tangy sandwich with full of vegetables and spicy mashed potato mixture. Use the thin slices of vegetables. Take all ingredients in grinder, and add ice cubes instead of water. and grind tile smooth paste. 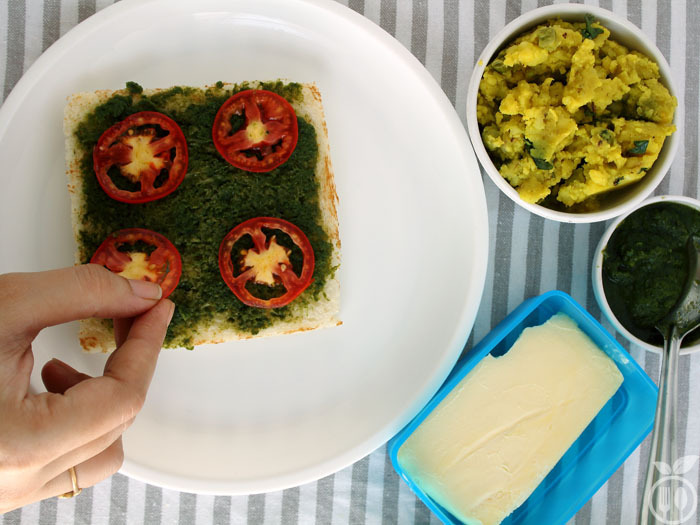 Ice cube will help to preserve the green color of chutney. 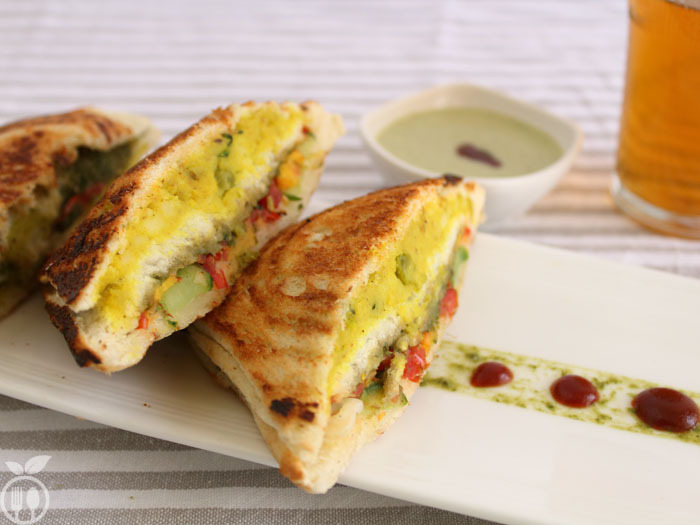 2 in 1 vegetable and mashed potato grilled sandwich is the combination of Bombay Vegetable Grilled Sandwich and Aloo Masala Grilled Sandwich (can also be referred as Mashed Potato Grilled Sandwich) which are very popular street food in Mumbai. In a pan heat the oil, add cumin seeds and let them pop. Once it starts to crackle, add green chili and ginger paste and crushed curry leaves and turmeric powder. Then add mashed potato, salt, garam masala powder. Slow the flame of gas, and mix the all spices with mashed potato. At last add green peas and lemon juice and give a nice stir. Make sure that , all the spices mix well with mashed potato. For assembling, take 3 slices of breads. In one slice, spread the mashed potato mixture about 2 tbsp mixture is required. 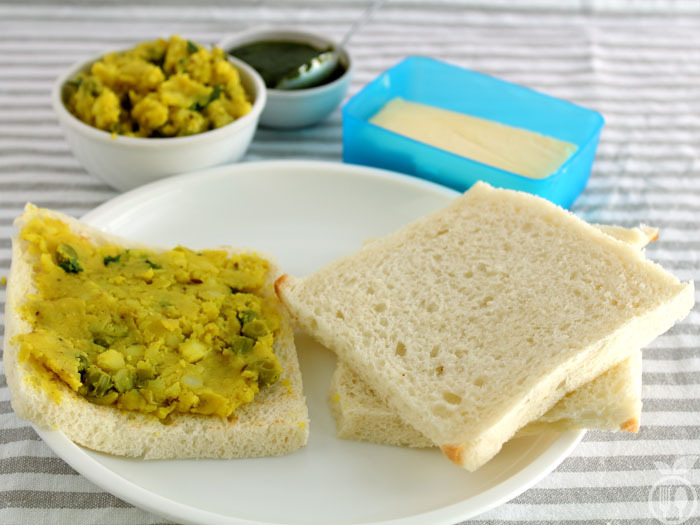 Now take second slice of bread, spread the green chutney according to taste. 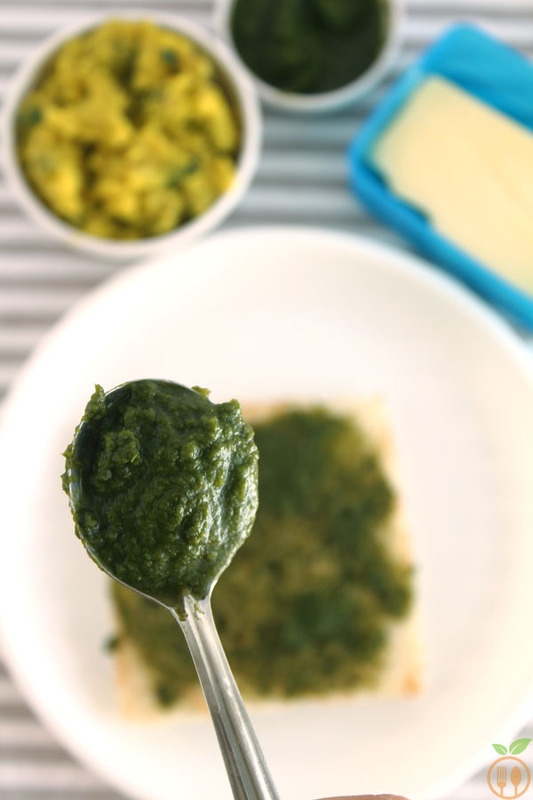 I used 2 tbsp green chutney. 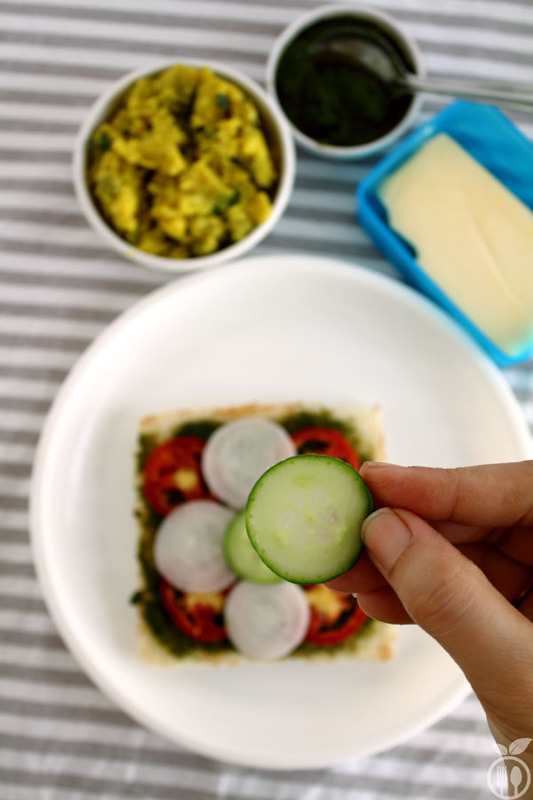 Now arrange tomato, onion and cucumber slices on the same bread. I have used 4 round slices of each vegetables. Now put vegetable stuffed slices on top of the potato stuffed slice. In a last slice of bread, spread the butter. and cover it top of vegetable stuffed bread slice. Two layer bread sandwich is ready. Grill it in griller or toaster until nice crisp golden brown color. 1) You can use any vegetables like beetroots, carrots, bell peppers. 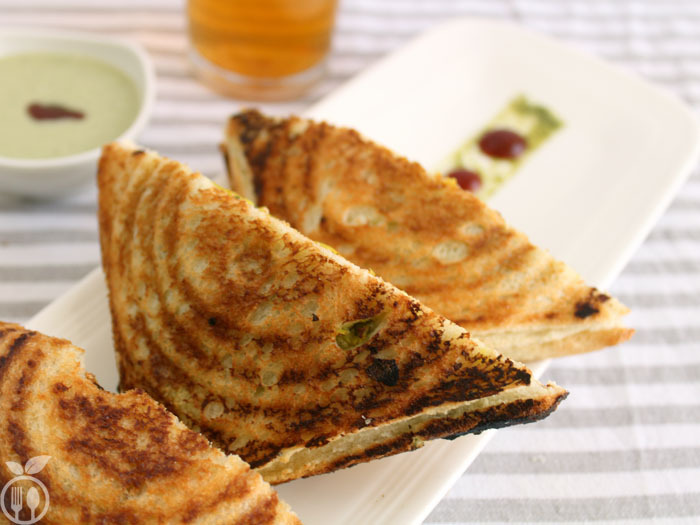 2) Serve with tomato ketchup or green chutney.